Greetings from Agora Valley site #2! 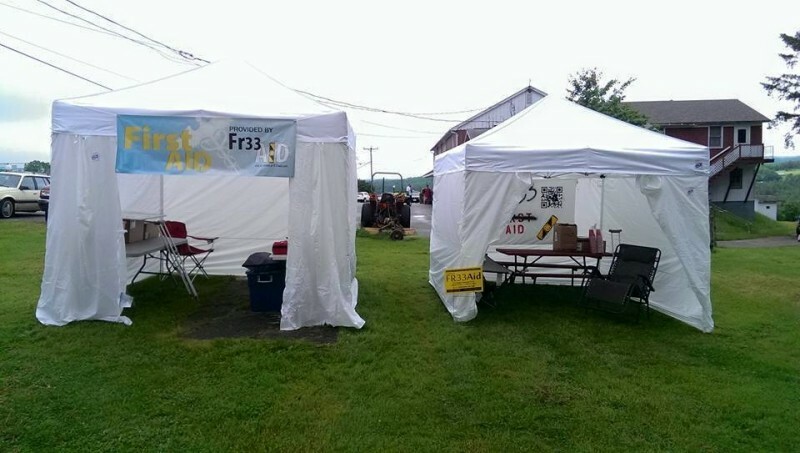 Fr33 Aid will be providing first aid to all at Porcfest again this year. This year I thought it would be good to have an end of day report as well as a final summary this year to document our impact on the community. Opening day. Stephanie and Brian worked hard to get the two tents set up before the rain rolled in Sunday. We had two patients today. One young child who fell and hit his face and a male in his 20’s with lacerations on his foot. Both patients were safely transported to the local medical facility for further treatment. You can find our signs throughout the campground directing you to site #2 for Fr33 Aid or to find a Porc Ranger and have them radio us. Happy Porcfest everyone! Have a safe week. Day two of Porcfest XII. Today we finished setting up our first aid supplies (bug spray, sun screen, band aids, etc.). During the day today we had a few calls. This morning there was a young boy with a fainting spell. He and his father utilized the cot in the Fr33 Aid tent to recover. We had a couple walk up to the tent looking for tweezers to remove ticks they found on themselves. A young lady got a bump on the head while playing on the playground. She was treated with a ice pack. A few other people came through the tent today for bandages. We will have two volunteers on call overnight tonight. If you have an emergency tonight you can get help by finding one of the Porc Rangers in the flourecent green shirts to call us. Thank you. I will update this blog post tomorrow with another end of day report. Today was a busy day here at the Fr33 Aid tent for our volunteers. We had a steady flow of patients for 5 hours upon opening today. Every 15-30 minutes a new patient would arrive. In the tent today we treated multiple people who needed assistance with tick removal. There was a woman who punctured her foot, a man who’s foot had blistered, and another patient who needed a new bandage on their foot. Fr33 Aid assisted in helping a free range child back to their parents. One patient who scratched a bug bite until it bled and needed assistance. A 9 y/o was playing a little too hard on the playground and took a tumble, our volunteers jumped right in and helped the child. Heading into the evening we had a patient with a puncture wound on their cheek and one woman who was complaining of allergies who wanted to use our antihistamine medication. Many other people came by today to use our sunscreen, bug spray and other various items we have available to the attendees of Porcfest. Talk to you all again tomorrow. Peace from Agora site 2. Come get your CPR certifications today in the Creating Communities tent at 1 pm. This is a huge step for Fr33 Aid. In past years we have taught CPR classes and we able to teach the skill but never accompany it with a certification. This year we will be providing AHA certifications to those who want it. Thanks to all our amazing volunteers for taking the time to teach this amazing life saving technique. Hope to see you all there! Today at the Fr33 Aid tent we talked to several people about keeping their feet dry and warm after a few days of heavy rain. Some folks had blisters, some with cuts on their feet because their skin is soft due to all the water. Patient with a bandaged up finger laceration from last night had a follow up and was recommended to the local hospital again for stitches, luckily one of their friends was there to help convince them to get the proper treatment. Today there was a young female who had been playing a little too hard on the playground. The parents found the child slightly less responsive and clammy. Patient was monitored in the tent and conditions improved significantly in a short period of time >15min. Again, there were several individuals with ticks on them that we helped remove. Keep up the good work checking yourself throughout the day for ticks! Fr33 Aid, in coordination with the Porc Rangers reunited a child with a missing mother. One walk up individual lost a q-tip in their ear. Patient was recommended to the hospital as it was beyond our ability to resolve. Later in the evening a male patient had a hand vs. hatchet injury. Bleeding control begun by volunteer, E.R. visit recommended. We had several call on the overnight shift, one of which was an emotional crisis. Luckily we had a volunteer working the overnight shift who was able to help this individual in need. This is a great example of the work we do that is not directly related to first aid in the traditional sense. We always are recruiting people who specialize in all kinds of medical and health fields. Two other calls that came through last night were dealt with in the tent by our alternate overnight volunteer. I’m glad we have such caring people to tend to those in need at Porcfest. When we opened the tent at 10 am we were met with another busy customer line going until 3 pm. We had children, young adults, adults, and even a dog! Our volunteers tented to all patients that presented today. The injuries varied, there were many cuts, some abrasions, bug bites, an ankle sprain, one case of knee pain, we re-bandaged several wounds from earlier in the week, and one volunteer responded to a camp site to stop the bleeding on a dog. The late afternoon gave our volunteers a much needed break. Then in the evening we had another rolled ankle, a leg abrasion and one male adult with blisters on both feet due to no socks. I donated a pair of socks to this individual to relieve the irritation. One patient who overindulged a little too much earlier in the day was brought to the tent, the patients vitals were monitored and we had volunteers stay with the patient for two hours when the individual felt well enough to walk back to their camp site. We would like to take a moment to thank our donors. It’s because of you that our volunteers continue to volunteer and your donations that keep us going. Last night we had an individual who was on an substance they were unfamiliar with come into the tent looking for help. One of our great volunteers was there and ready to take vitals and talk to the person into a better mental space. Patient utilized our cot for a bit then decided to head back to their own bed for the night. People continue to flow into Rogers Campground for all the fun Porcfest has to offer. As it has been for the past 5 years, Fr33 Aid is here to help anyone in need. The guests safety is always on our minds. In the morning we had a patient who came in with small red bites and was concerned they were tick bites, they were not. There is an leaflet that came with the purchase of every guest ticket about ticks and some great information on them. Today we had an individual who was skilled in a very particular area of medicine offer his service to Fr33 Aid if the appropriate situation arose. We are thankful for everyone looking out for each other. Friday turned out to be one of the busiest days of the week as we anticipated. We dealt with splinters, a few blisters, many minor cuts, a couple twisted ankles, bug bites, patients with nausea and vomiting. We taught an individual CPR today, most of our volunteers are comfortable enough to do this so if you happened to miss the class or just want a quick refresher on the skills come on by and we will be glad to help. There is an individual who is on blood pressure medicine, we have been checking his vitals all week to make sure the medicine is working as directed. Patients blood pressure was within normal limits all week. Stephanie Murphy, Josh Katz and Michael Lindskog took part in a panel discussion today in the Alt. Expo tent about Fr33 Aid. You can find full discussion here. Nobody wants to hear it but Porcfest is almost over. Fr33 Aid is still running strong and here for all your first aid needs, camping supplies and items you might have forgot at home. The wind has picked up and a storm is supposed to rolling in tonight into tomorrow. There were some people breaking down their tents/ camp sites early to avoid the issues that come with breaking down in the rain. We worked the overnight and took care of some patients. One was a cut thumb, one was a double swollen ankle injury and the final overnight call was a bug bite on the leg of a concerned individual. We opened our doors for service at 10 am but had a few early morning calls. Some of those calls included a toe laceration, a re-bandaged wound, splinter removal and a patient who needed an antihistamine. Today we stayed busy helping people with many different issues; We helped people with abrasions, lacerations, a superficial burn, a penetrating cut, a re-bandaging of a wound, a bug bite on a leg with swelling, elbow pain, as well as cleaned and treated a two day old cut. We recommended several people to the hospital today for further treatment, the penetrating wound on a patient earlier in the day had reopened and stitches were most likely needed. A patient with a nerve issue in the foot was recommended to the hospital for pain management. Later in the day when a group of individuals were carrying the large wooden porcupine to the fire someone had a misstep and rolled their ankle in a small ditch. They were at 10/10 pain and we had to call the ambulance to take them to the hospital. We were able to get the patients ankle splinted and on ice. We saw the patient off into the ambulance and they were back at the campground later that evening. Mother nature was less than happy about Porcfest being over and decided to throw a temper tantrum. As we awoke in the morning we were greeted with heavy wind gusts and rain. One of our tents, that we were using to help people all week, was ripped right out of the ground and folded over onto itself rendering it inoperable. People were scrambling to pack up their wet and torn items, it was chaotic. We managed to walk around and collect all of our yard signs. All of our supplies were put back dry. We did not have any patients today. We want to wish everyone a safe travel home in this unpleasant weather. This is one week where a group of freedom loving individuals get together and show that alternative societies can operate in peace. In parallel with the “real world”, we are showing on a small scale how we can peacefully exist and create alternatives to State monopolized institutions. This week Fr33 Aid had an amazing impact on the Porcfest community. Between logged calls, non-logged calls, CPR training, heath and wellness education we personally helped over 100 individuals. That’s about 10% of the attendees of this year’s event! We continue to push our organization forward via monetary donations and individuals volunteering their time and skills to help others in need. This year we received cash and bitcoin donations, about $200 in all. That breaks down to just under $2 per call, which even for basic first aid would be cheap to pay anywhere else. We do not require anyone to pay for services rendered, whether it’s first aid, psychiatric help, a daily check up, or anything else. If you feel we provided you with value at Porcfest, or just like the work we do, and would like to make a donation you can scan the bitcoin QR code at the bottom of this post. I am thankful I have learned the skills to take care of people in need with calmness and precision. I am thankful for being able to utilize these skills on individuals in need. I am thankful for the warm fuzzies that I get when people are satisfied with the treatment they received. I am thankful for the smiles and gratitude of patients. I am thankful for the founders of FR33 Aid, creating a platform for me to help others in need. I am thankful for all the amazing discussions had with individuals at our tent and across the campground.